The cross you see in the picture comes from Rev. Dr. Fung Lo. He and his wife are missionaries to the Hmong culture in Thailand. Last May he came to the Saginaw area and share their ministry opportunities. During his stay he presented this cross to us. Also while here we accepted the Hmong Mission Society’s invitation to go to Thailand to speak at a prayer conference. 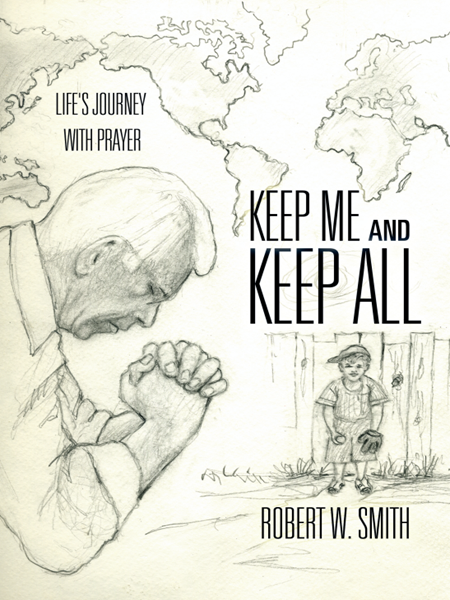 My book, Keep Me and Keep All - Life’s Journey with Prayer has been translated into the Hmong language. It will help to provide guidance, strength, hope, and encouragement to the Hmong people in their life’s journey with prayer. The Hmong Mission Society of the Lutheran Church Missouri Synod plans to have the book published this fall in Thailand. The book will then be distributed in Asia and the United States. The Hmong Mission Society is asking for financial assistance to facilitate this huge mission project. Funding is needed to help with translation, publication, and shipments to the United States and Southeast Asia (Thailand, Laos, and Vietnam). The Prayer book will be a valuable tool in the hands of Hmong Christians. It will be a resource about prayer in their own language through which they can share the love of God with their non-Christians relatives and friends. They do not have many Christian books in Hmong. A Seminar on Prayer will be held in Chiang Mai, Thailand in December. Presenters will include Rev. Dr. Lang Yang, Rev. Dr. Fung Lo, Rev. Robert Smith, and their wives. The estimated cost for Rev. and Mrs. Smith to participate in this mission project will be $10,000.00. This includes publication of the book and other expenses such as travel, lodging, and food. It also includes the expenses for workshop classes for the pastoral students and their spouses to be trained in Thailand from December 13-22, 2018. You can support this mission project in two ways. First, and above of all, please include this mission project in your prayers. Secondly, your financial assistance will help the expansion of Christ’s Kingdom so that our brothers and sisters in Christ in the Hmong culture will be able to learn how to talk to the Triune God through prayer. Your support is greatly appreciated. Thank you. 3455 S. Van Buren Rd. In the past we have shared crosses from around the world. This time the cross is from right here in Frankenmuth. It comes from Wally and Irene Bronner. Wally was known as “Mr. Christmas.” The City of Frankenmuth embraced being the home to Bronner’s CHRISTmas Wonderland, the World’s Largest Christmas Store. Frankenmuth was recently designated one of the nine most Christmassy towns in America according to TIME. While the whole town glows with star streamers and twinkling light during the holidays, Christmas Lane at Bronner’s is illuminated 365 days a year with over 50,000 strings of lights and the Silent Nigh Memorial Chapel is wonderful any time of year. In 1962 I arrived as a young interim teacher from Concordia Teachers College, River Forest, Illinois. In my first class I had Wally and Irene’s son, Wayne. During the Spring Wayne had an illness that keep him out of school for about a month. I went over to his home to keep him up with our class. 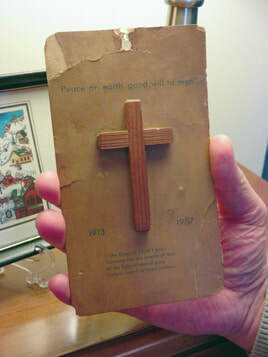 At the end of the time Wally and Irene presented me with this cross from the new Day Star company. For many years the Bronner family has supported mission work around the world through their prayers and financially. Alice and I and our sons have been on the receiving end of being blessed. Wally, Ray Bauer and I also started an 6:30 a.m. Wednesday morning men’s Bible class that continues to meet today. Wally was one of many great Christian men that mentored Bob Smith over the years as the Lord used me around the world. There were two Christian characteristics that I remember about Wally, humility and servanthood. Servant is a person who has the ability to relate to people in such a way that the other person’s dignity as a human being is affirmed and that person is able to live his or her life to God’s glory. Wally left the legacy of being a great example for everyone of this definition of servanthood. This cross from our collection reminds me to use Wally and Irene’s motto for their Christmas store to end this presentation. Enjoy CHRISTmas. It’s His Birthday. Enjoy Life. It’s His way. See some photos of the World's Largest Christmas Store below, in the slideshow. For it is by believing in your heart that you are made right God, and it is by confessing with your mouth that you are saved (Rom. 10:10). 2017 marks the 500th anniversary of the Lutheran Reformation. This year gives us all a chance to learn more about this critical time in the history of God’s church. To commemorate this milestone I will highlight a small snippet of the history of the reformation that is not well known, namely Luther’s Seal. One of the crosses from our collection features Martin Luther’s seal. "From the wilderness of Koburg Castle"
May Christ, our dear Lord, be with your spirit until the life to come. Amen." First, there should be a black cross set in a heart, which should keep its natural color. This will remind me that faith in the Crucified saves us. Because: "If you believe in your heart, you will be justified." Even though it is a black cross, which kills us and causes pain, yet it allows the heart to remain its natural color; it does not destroy the heart's nature, that is, it does not kill the heart, but keeps it alive. Because "The just will live by faith" - but faith in the Crucified. Now, although the cross is black, mortified, and intended to cause pain, yet it does not tend to change the color of the heart, does not destroy nature, i.e., does not kill, but keeps alive. "For the just shall live by faith'' - by faith in the savior. 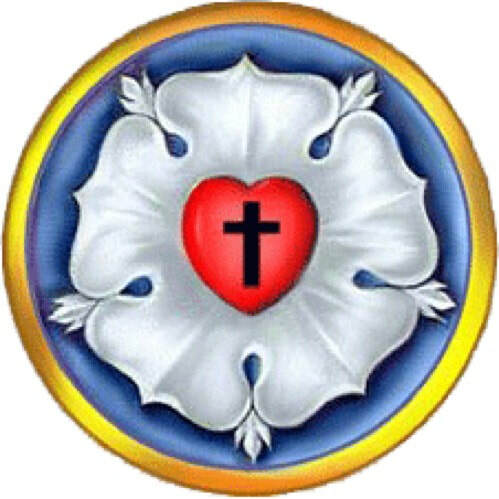 But this heart is fixed upon the center of a white rose, to show that faith causes joy, consolation and peace. The rose is white, not red, because white is the ideal color of all angels and blessed spirits. The rose, moreover, is fixed on a sky-blue field, to denote that such joy of faith in the spirit is but an earnest yearning and beginning of heavenly joy to come, as anticipated and held by hope, though not yet revealed. And around this sky-blue field is a golden ring, to signify that such bliss in heaven is endless, and more precious than all joys and treasures, since gold is the best and most treasured metal. Christ, our dear Lord, He will give us grace unto eternal life. Put them all together, to get the complete seal. … Be faithful unto death, and I will give you the crown of life (Rev. 2:10). 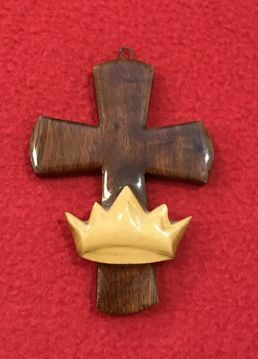 This cross was made by the Reverend Wally Rasch’s family in Nigeria. They gave it to me as a special gift at my ordination. What happened in November of 1986 was no coincidence - God again put all this together. I came to Nigeria with Alice and our sons to serve my vicarage that the Lutheran Church requires. After a year of supervision under Wally, I was ready to be officially ordained as a Lutheran pastor. The Lutheran Church of Nigeria decided to have my ordination at the 50th anniversary celebration of the first LCMS missionaries coming to Africa in 1936. My ordination became a historical event beyond anything I could have dreamed. Wally, his wife Betty and family taught me by example three characteristics are needed to have prayers answered and work in lives: humility, trust and obedience. I have learned to pray in humility asking for God’s help, then continue praying with trust, and conclude my prayers with obedience. What happened during my vicarage years and ordination was totally by God’s direction and blessing. Surely God answers our prayers beyond our expectations. Just let God work it out. I don’t need to tell God how to solve my problems. I present them to Him and let Him provide the solutions. The two crosses shown here were gifts given to us from the Lutheran Education Association of South Africa. We spoke with teachers, students, church workers, and lay people as we moved to different locations across the country. The experiences were unforgettable. These two crosses will continue to remind us of the wonderful opportunities we had to witness for Jesus and build positive relationships in South Africa. Personally what did I learn from my experience in Africa this year? To depend on God more. To depend on His promises to bear fruit through each of us. One of my weaknesses lies in not taking Jesus at his word. This whole African experience was a visible demonstration of the power of God working through His people. There is an URGENT NEED FOR SHARING THIS HOPE throughout the world. Lutheran schools are providing the hope of Jesus Christ. - The Lord gave Alice and me many circumstances to talk about the hope of eternal life through Christ not only in South Africa but also Ghana. It was a tremendous privilege. The beginning story of this cross actually goes back to 1326 when medieval craftsmen hammered into the oak beams of the roof of the ancient St. Michael’s Church in Coventry, nails hand-forged by unknown medieval town smiths. The fourteenth century cathedral church at Coventry was reduced to ruins by fire bombs during the night in November, 1940. This was the night when Coventry suffered the longest air raid of any one night on any British city during World War II. It seemed to be the end of a great church building which had been a citadel for the worship of God. After the bombing, large fourteenth century hand-forged nails which had fastened together the ceiling beams littered the ruined floor of the sanctuary. These nails were formed into a cross of nails which since has been a silent but eloquent statement that God forgives. The church was rebuilt – and the cross of nails still stands as a witness that Christ lives – in the NOW! The Cross of Nails was made of three nails from the roof truss of the old cathedral by Provost Richard Howard of Coventry Cathedral at the suggestion of a young friend, The Rev. A.P. Wales. The Christian response to the devastation was the utterance of Jesus from the Cross: ‘Father Forgive.’ It has become a symbol of peace and reconciliation across the world. There are over 330 Cross of Nails Centres all over the world, all of them bearing a cross made of three nails from the ruins, similar to the original one. When there were no more of these nails, a continuing supply has come from a prison in Germany. They are co-ordinated by the International Centre for Reconciliation. Inevitably, the Christian response to the devastation was the utterance of Jesus from the Cross: ‘Father Forgive.’ The new Cathedral, built next to the ruins, now grows like a limb from the old, and the heart of the Christian religion is proclaimed in the rhythm of ‘Crucifixion-Resurrection through Forgiveness.’ ” Today, the Cross of Nails stands as a world-renowned symbol of reconciliation and hope. The center bar is that upon which Christ’s arms were stretched and nailed. The bottom bar signifies the footrest which supported His body. On the Russian Orthodox Cross the slanted bottom bar is the foot-brace. In 1994 when I was Chaplain at Valley Lutheran High School in Saginaw, Michigan. The students there were invited to witness to Novgorod, Russia Public School #31. We were able to share a Christian witness and gave away over 2000 Bibles and salvation bracelets during this nine day Easter break trip with 22 students and ten adults. 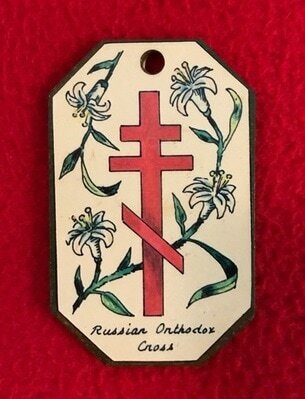 This is when we became familiar with the Russian Orthodox Cross. This once in a life experience is remembered when this variation of the cross is seen. More about this trip can be seen in the video clip. And a stable beneath a star. At the Baby whom they saw. With precious gifts to bring. Was their Savior and their King. And did not count the cost. It is not all about shepherds, angels in heaven, wise men traveling so far. The beginning is about His birth but His ending is what saves you. The goal of Keep Me and Keep All website is to enrich, encourage, and enhance your prayer life so it can be enjoyable, effective and enduring. The cross of Christ has a close connection with prayer. The cross restores the vertical relationship between you and your maker. But the cross also has a horizontal beam. The cross of Christ also restores others to God. The horizontal beam reminds you that prayer is also about the world. God loves you, but he also loves the world. Your prayer life is not an exclusive love conversation between you and God, and it’s not just for your spiritual growth. Your prayer life is also for the world. Your prayer life is your greatest means of changing the world for Christ. May your understanding of Jesus’ birth lead you to an understanding of His death on the cross. St. Brigid also known as “Mary of the Gael” is a patroness of Ireland, and she is also the founder of the first Irish monastery in Kildare. Born in Dundalk in 453 A.D. She became a nun whose desire was to relieve the misery and hardship of the poor. St. Brigid is accredited with first creating the unique cross that bears her name, which is normally made from rushes but occasionally from straw. 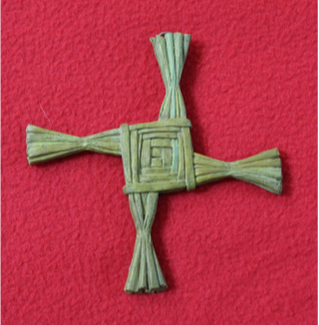 The distinctive St Brigid’s Cross design made from woven grass like hollow stems. The tale is as follows: There was an old pagan Chieftain who lay delirious on his deathbed in Kildare (some believe this was her father) and his servants summoned Brigid to his beside in the hope that the saintly woman may calm his restless spirit. Brigid is said to have sat by his bed, consoling and calming him and it is here that she picked up the rushes from the floor and began weaving them into the distinctive cross pattern. Whilst she weaved, she explained the meaning of the cross to the sick Chieftain and it is thought her calming words brought peace to his soul, and that he was so enamored by her words that the old Chieftain requested he was baptized as a Christian just before his passing. Since that day and for the centuries that followed, it has been customary on the eve of her Feast Day (1st February) for the Irish to fashion a St Brigid Cross of straw or rushes and place it inside the house over the door. This rush cross, which became St Brigid’s emblem, has been used in Irish designs throughout history, with many modern stylists using this now popular Irish symbol within the designs of Irish jewelry and Irish gifts. … and repentance for the forgiveness of sins will be preached in his name to all nations, beginning at Jerusalem (Luke 24:47). Across the world the message of the cross is being presented to every nation. God is using dedicated Christian missionaries to communicate the significance of the cross in every nation. Through the power of the Holy Spirit this message can transform people into followers of Christ. The cross pictured here comes from the country of Thailand. Population is more than 68 million. More than 85% of the people claim to be Buddhist. Less than 3% are Christian. It is very difficult for the Thai people to understand how you can be from the nation of Thailand and be a Christian. The nation has been a kingdom since the 13th Century, and never ruled by a Western power. It is the world’s longest reigning monarch and plays a strong, unifying and stabilizing role. Freedom of religion is guaranteed in the constitution but Buddhism is the predominate faith. 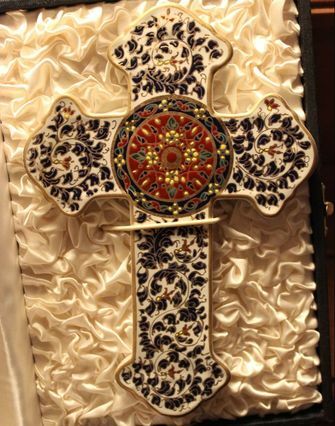 This beautiful cross is from Thailand. It was given to us by Dennis and Monta Denow. Dennis serves as the Asia Pacific Education Consultant, Monta directs the Lutheran Hour Ministries for Thailand. The cross reminds me how God is working through the talents of these two people and touching the nation. Daily I pray for this couple. Their work is God at work. An inseparable link exists between prayer and effective missions. It is His will that you, a child of God, pray for world evangelization. Have you discovered this wonderful opportunity and responsibility to pray for missionaries? Keep informed about missionaries in various countries. Learn all you can about a missionary: their family, the country where they are serving, the type of work they do, the people with which they are working. I challenge you to ask God to help you pray intensely, intelligently, with His Spirit’s power, and to keep your intercession fresh, vital, and directed to specific needs a cross cultural missionary or missionaries. ​Make every effort to keep the unity of the Spirit through the bond of peace (Ephesians 4:3). 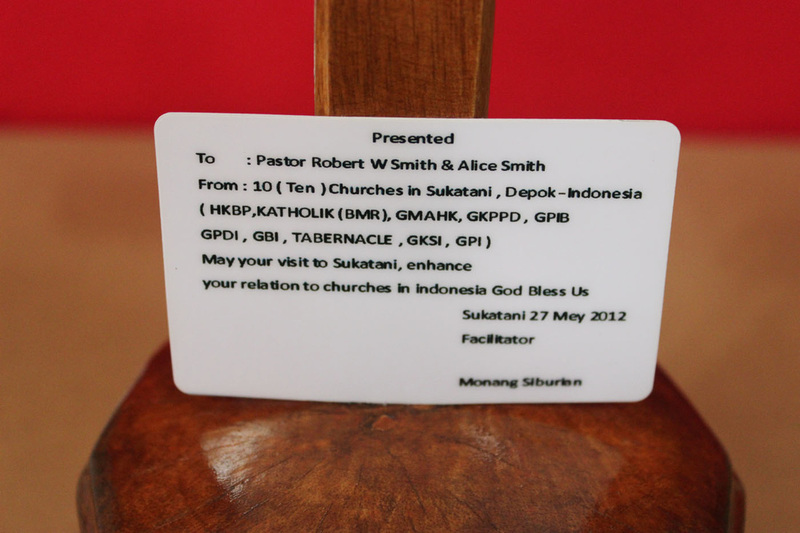 Many inspiring Christians crossed our paths in Indonesia. Each of them had a story to tell of how God used them to influence this world in a positive way. General Monang is one whom Alice and I met during the World Prayer Assembly. He was raised in a Batak family on the Northern part of Sumatra Island. He is a member of the HKBP church that has Lutheran roots. A meeting was arranged for us to meet the following week in Jakarta. As a young man General Monang went to an Indonesian military school academy. This eventually led to special training in the USA. He lived through other experiences in Vietnam, Australia, Papua and other places. He is now a consultant to the Indonesian government. 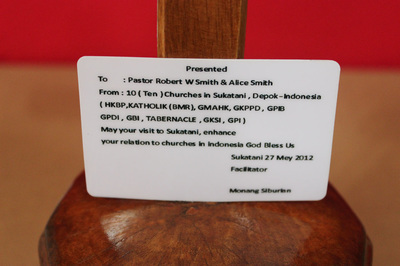 My first visit with General Monang led to an invitation to attend a Batak church service on May 27th in Cibubur . The land on which the church was built was owned by the General and his family. Today, ten different churches are holding services on the grounds each weekend in five different buildings. The Batak people are well known for their beautiful and enthusiastic singing. The Church service we attended certainly demonstrated this characteristic through the youth and women choirs. Following the morning service, a lunch or pot luck meal was provided. All ten churches gathered on Pentecost Sunday to greet us and to hear a message from this foreigner. It was truly an experience I’ll not forget. The Holy Spirit brought these people together from all of these religious backgrounds and cultures within Indonesia. I was not told ahead of time I was to share a message. It was all done by the leading of the Holy Spirit. The people however, had planned ahead by the guidance of General Monang. At the end of the message a special gift was presented. It was a hand carved cross on a base with the names of all ten churches. The Lord continues to amaze me. They had no idea we have a collection of crosses from around the world. 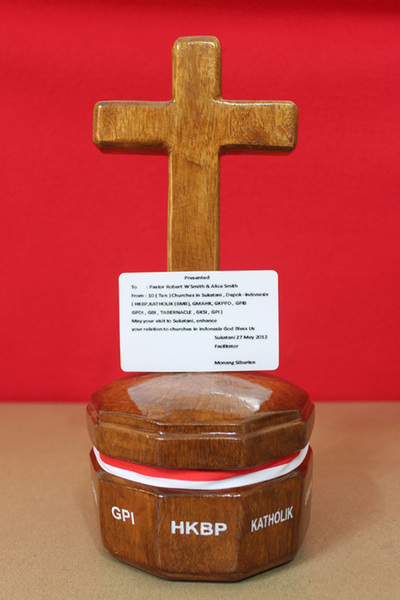 The cross is made from a special tree grown in Papua. Wow! What a magnificent remembrance of the day of Pentecost 2012. General Monang wasn’t finished. He and his wife escorted us to two other places. We accompanied them to an extended Batak family celebration with several hundred people. Again, we heard singing and saw traditional dances of the Batak culture. I was asked to speak and lead them in prayer. This was another special moment for us to experience and witness. General Monang sees the common unity with other Christians under the cross of Christ. He does not stress the dissimilarities. When we were in Indonesia we were happy to have openness and acceptance other Christians. We are challenged to do the same wherever we are in the world. A traditional Korean CHIGE was used by farmers and workers to carry heavy loads. The design of this wooden carrying frame allowed the bearer to carry burdens of great size and weight while walking, even on steep hills. The Korean crucifix reminds me of Matthew 11:28 “Come to me, all you who are weary and burdened, and I will give you rest. This verse comes with an invitation. Every person will eventually be visited with disappointment, depression, grief, tragedy, and sorrow. God, our Father reveals His divine plan of redemption and help. He calls out to us to move towards Him for support and comfort. When we are weighted down with heavy loads we are to come to Him. This is similar to what we sometimes tell the Lord when we worry. Some of us today are carrying burdens of sorrow and grief the Lord never intended believers to carry…but we seem to insist! We are to place God at the center of a stressful life. He is the best burden bearer to reduce our anxieties. In PRAYER we are to bring countless fears, insecurities, and guilt to Jesus. Leave them at the foot of the cross. Scripture is full of promises to reassure a believer of God’s help. Burdens are meant to be SHED. 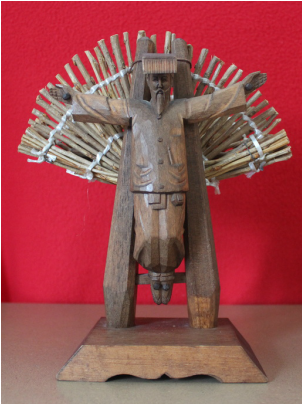 When I see this Korean CHIGE with a crucifix I am reminded to surrender my worries to Christ. 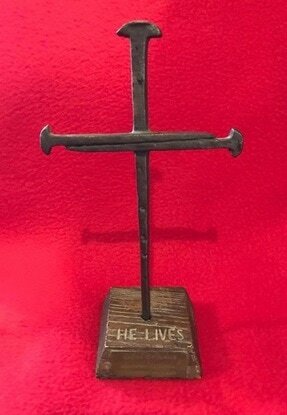 ​When I look at the crosses that my wife and I have collected over the past fifty years, I am touched by the love of God these crosses represent. I challenge you to examine more closely the majesty, mercy, and mission of His Son, Jesus Christ represented through the crosses you encounter across the world. 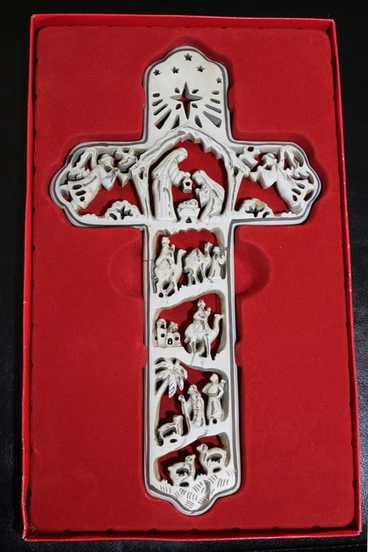 Today I would like to tell you about a crucifix cross I received while serving in Calcutta, India. 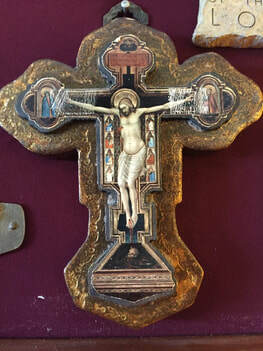 This Crucifix arouses deep and conflicting emotions as I recall stories surrounding it. Calcutta has thousands of children and beggars who live on the streets of this terribly polluted city. I can still see the eyes of the two little girls who grabbed my legs and would not let go. For four years in a row, I led delegations of students from Seoul Foreign School on week-long service learning trips where we volunteered to help at Mother Teresa’s Missionaries of Charity in Calcutta. I received this crucifix cross from Father Immanuel who was the priest of St. James Anglican Church. This is a huge cathedral church directly across the road from the building where Mother Teresa lived and is now buried. St. James provided the dormitory rooms where our volunteers stayed for the week. These uncomfortable trips taught me many truths about the love, compassion, care, concern, and service to our great God. 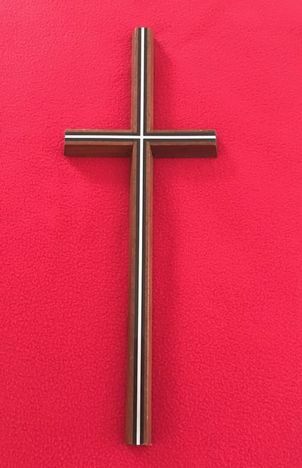 This crucifix cross invites me to meditate on the lessons of love I learned through the examples of Mother Teresa, The Sisters of Charity nuns, Father Immanuel and others we met. I am a different person today because the Holy Spirit worked in me and others during those experiences in Calcutta. It became a privilege and not a problem to volunteer and work among the poorest of the poor. The cross with Jesus crucified is known as a "crucifix". The cross by itself is just a "cross". The difference between the cross and the crucifix is that we remember Christ crucified when we look upon the crucifix, and Christ risen when we look upon a plain cross. That's the short, simple explaination. 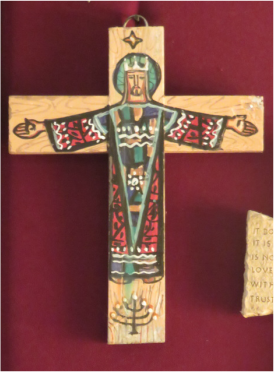 Western crucifixes usually have a three-dimensional corpus or body, but in Eastern Orthodoxy Jesus' body is normally painted on the cross. Martin Luther did not object to crucifix crosses unlike many other Protestants. Luther at the time of the Reformation retained the crucifix in the Lutheran Church. 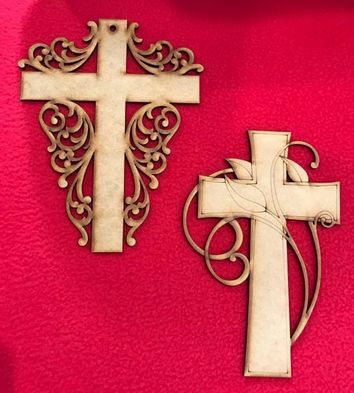 During the last fifty years Alice and I have collected many crosses from around the world. Some have inspirational stories about the people or places. We would like to share a few of these stories. Six pastors preached approximately 2600 sermons, heard by over 100,000 listens. 511 were received as children of God in the Sacrament of Holy Baptism. 451 confirmed their faith in the Triune God. Over 25,000 received the Sacrament of the Lord’s Supper. 140 couples exchanged vows of in Holy Matrimony. 126 members were laid to their eternal rest.